I am an avid collector of Superhero Role Playing Games with a collection that ranges from Superhero 2044 to Icons: Assembled Edition. It's a bit of an obsession with me and I have it as a goal to eventually own every super hero role playing game ever published. The advent of digital publishing has made this a little more difficult than it was, as it has led to an explosion of super hero games, but I am still trying. A perfect example of how difficult this can be is Plaid Rabbit's Modern Knights superhero role playing game. Have you never heard of Plaid Rabbit or Modern Knights? They were a part of the growing digital publishing industry in the late 90s and early 00s. Much like Steve Jackson Games' digital Pyramid, finding copies of Plaid Rabbit games is nigh impossible - especially if you are like me and seek to only acquire your games through legal means. Digital is great, but when material disappears it strangely really disappears. And this is in a format that should allow for truly deep catalog retention due to ease of "shelf space" etc. But we collectors don't just have to worry about the evaporation of digital games, because our collecting mind is also tortured by the "advertised but never released game." These are games that were far enough along in the development cycle that the publishers spend advertising dollars to promote them, or at minimum to offer them for solicitation. When it comes to this category of games, there are two superhero role playing games that I would have loved to see in print. I also hope that the publishers - one that is still in business and one recently resurrected - see fit to at minimum offer these games digitally. d20 Spectaculars: New rules for running a d20 Modern campaign in a super-heroic setting. This new supplement for d20 Modern provides a campaign setting where player characters become the first super heroes. Characters begin with only a few tricks, but as they increase in level they gain fantastic powers. 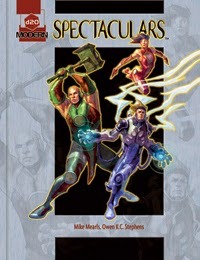 d20 Spectaculars provides everything players and Gamemasters need to participate in super-heroic adventures, including rules for super powers, power trees, new classes, and equipment. A full campaign setting with material and adventure seeds suitable for all levels of play is included. Let me repeat those designer names again. Mike Mearls (who's work on D&D has been spectacular), Bill Slavicsek (Paranoia, Star Wars, D&D, Pokemon Jr.), and Owen K.C. Stephens (a designer who can make the d20/3.x/Pathfinder system do essentially anything) were the designers on the project. Stephens has been as open as an NDA allows on the subject, but he has made it clear that the designers were paid and treated well even though this product was cancelled. I desperately wish that Hasbro would devote like 60 hours of development to finish the manuscript and put it up on their D&D Classics page. That's all I ask...that or a super secret copy of the unpublished manuscript which I will put into a steel vault and never mention to anyone. 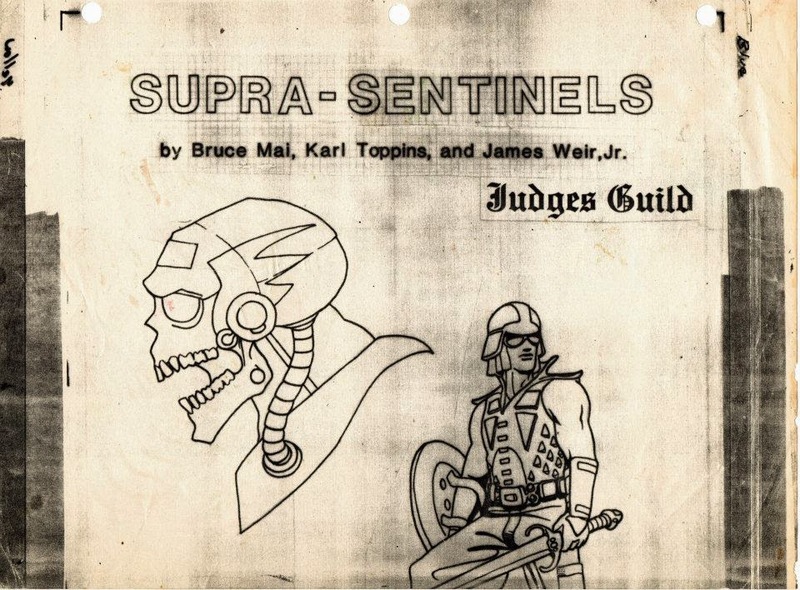 On the opposite end of the "graphic design" and "modern mechanics" spectrum is Judges Guild's never released Supra-Sentinels role playing game. 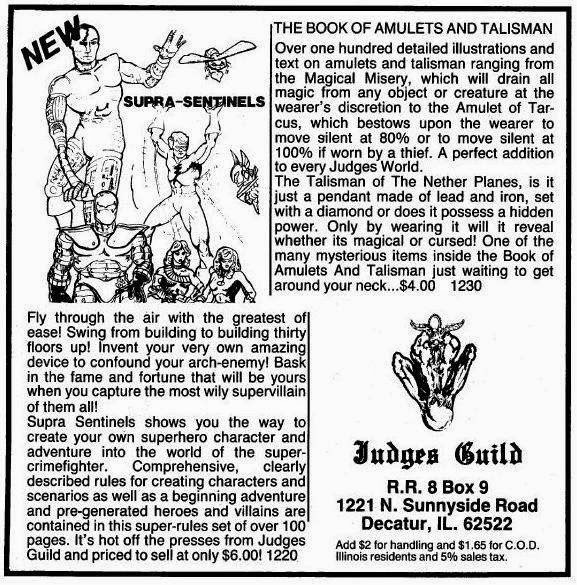 The game would have likely been published in 1983 if Judges Guild hadn't gone out of business. Based on the publisher, the art, and the advertisements, this game would have been an interesting glimpse into what a late stage old school superhero role playing game would have looked like mechanically. There has been some talk by the designers of the game - on rpg collector message boards - that there is interest in seeing this game published. Given Judges Guild's stuttering rebirth in the early 00s, followed by their recent Kickstarter and cooperation with Goodman Games, it seems like a possibility. 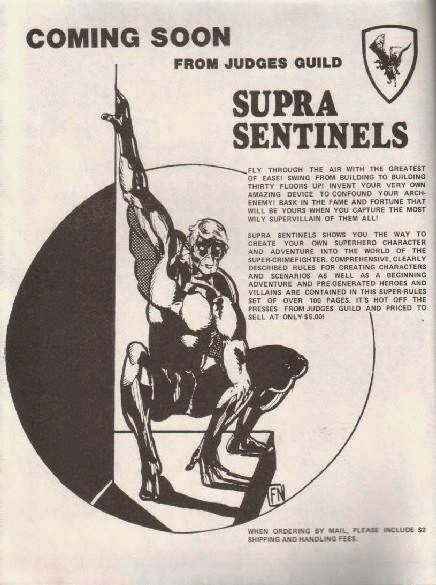 Given that Goodman Games is publishing old Judges Guild modules - and Journals - in hardback format without "updating," I would love to see them give Supra-Sentinels a similar treatment. I honestly don't know what the market outside of "me" looks like for these products, but I would purchase them in a heart beat. I'd even try to get my players to play them for a spell. Then again, if I could get reliable contact information for Donald Saxman I'd love to see if he would be interested in doing a 2nd edition of Superhero 2044 with some rules editions by Wayne Shaw. 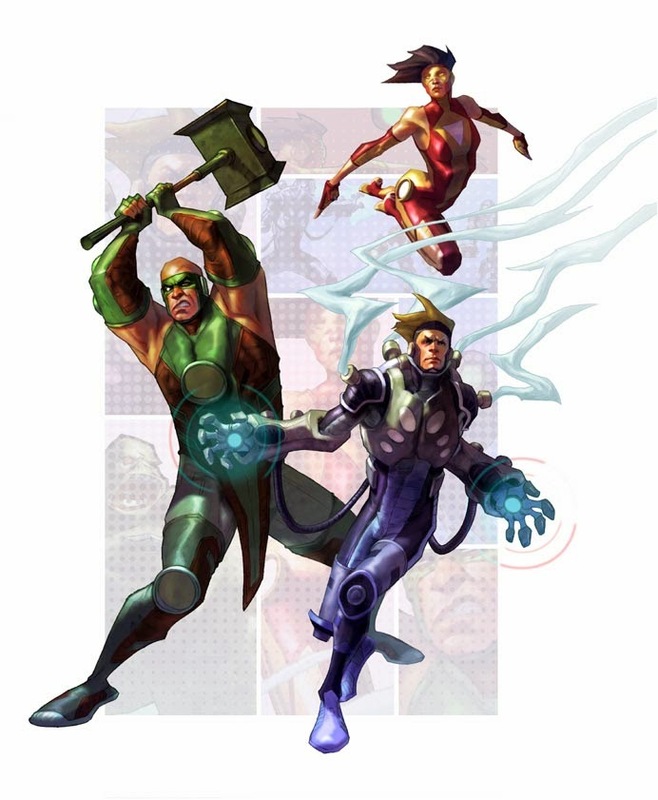 I'd love to do an edition of the game that highlighted the influence that it had on the superhero game genre. Speaking of which, it's time for me to get my nose to the grindstone and finish that Superhero 2044 combat tutorial I promised.